The wood laminate floors and upgraded kitchen provide a clean and crisp new home feel. The bedrooms are located on the second floor and the master bedroom is equipped with a walk-in closet and double-sink bathroom. Includes a private courtyard, garage parking and a separate laundry room. 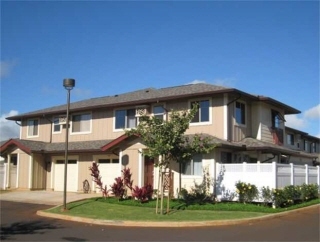 Mililani Mauka is a premier master-planned community featuring top rated schools, excellent shopping and quality homes. Interior Features Upgrades Include: Flush Melamine Cabinents at kitchen and bathrooms oiled Cherry, Pull out Kitchen Faucet, Insulated Garage Door, Belt driven garage door opener, Wireless keyless garage door opener, Dedicated Single outlet in laundry center $325 (so it is safe to plug an additional refrigerator in the laundry room), Alarm system with motion sensors, Upgraded refrigerator, range, microwave with hoodfan, and dishwasher to stainless, Kitchen counter upgrade, Laminate flooring with side moldings, Stackable energy efficient washer/dryer and Bathrooms white cultured marble countertops.